Our school uses Destiny Quest, an easy to use tool designed to help you find books you're looking for. Books on topics that interest you and by authors you love are just a few clicks away. Dewey Love Books? Yes we do! While lots of books in your school library are organized by author, many others are organized by subject (what they are about). This includes all of our Non-Fiction books. The chart below lists categories from 000 to 900. 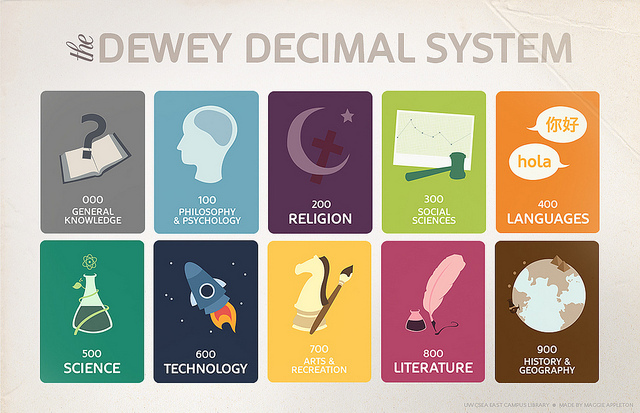 These are the main categories of the Dewey Decimal System. The best way to explore and learn about the Dewey Decimal System is find books that interest you AND to choose from a wide range of topics. While you're at it, make note of the spine label. That's the sticker with numbers and letters that make up the Dewey address found on the spine of each book in the library. Each subject has it's own number. For example, books about dinosaurs all have the number 567.9. We organize all the books numerically so that all the books about dinosaurs, or any other topic, will be found together. To help get you started, here are some of Mr. Richey's recommendations in each Dewey category, plus the exact Dewey address for each. Remember, all of the books in the Dewey Decimal System are organized in order from 0 to 999. Knowing this, and with Mr. Richey and your teacher to help you, I'll bet you can find what you're looking for.